Jolted by three quick wickets, India were left with the tricky task of scoring 204 runs for victory on a fifth day track after allowing Sri Lanka to stage a remarkable recovery in the third and final Test which seemed headed for a nail-biting finish on Friday. Chasing 257 for a win, the Indians were tottering at 53 for three at close on a thrilling fourth day's play. The hosts had snapped the key wickets of Virender Sehwag (0), Rahul Dravid (7) and Murali Vijay (27) to raise hopes of a 2-0 series win. Veteran Sachin Tendulkar (11) and night watchman Ishant Sharma (2) were at the crease at stumps on an absorbing day's play which saw fortune fluctuating from one team to the other. Off spinner Suraj Randiv, who opened the bowling attack, scalped all the three wickets to give his team the upperhand. The Sri Lankans recovered brilliantly from the dramatic middle order collapse to score 267 in their second innings. The hosts relied on Thilan Samaraweera (83) and tailender Ajantha Mendis (78) to salvage the situation after being at a precarious 125 for eight at one stage. The duo put up a resolute 118-run ninth wicket partnership to save the blushes for the team. The partnership not only frustrated the Indians, who had put themselves in command in the morning session with five quick wickets for just 24 runs, but made their victory target a lot stiffer. 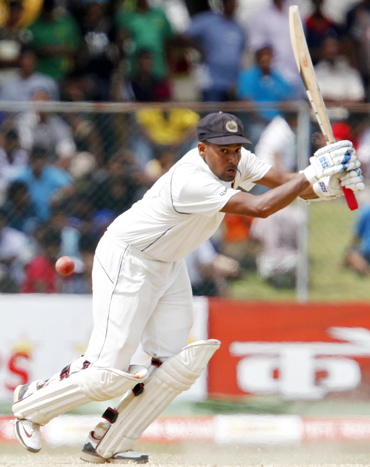 Samaraweera stitched his ninth wicket partnership with Mendis by taking singles and twos, before exploding in the 55th over when he hit a superb sweep shot of Sehwag to bring up his fifty off 79 balls studded with six boundaries. He also picked up Mishra for some special treatment when he reached down the track to a flighted delivery and hammered it past the bowler for a boundary. His knock of 83 came off 139 deliveries and contained six boundaries. Abhimanyu Mithun had him caught by MS Dhoni. Mendis, on his part, also played some aggressive shots after getting his eye in. The carrom bowler got the first six of Sri Lankan innings when he blasted Ojha with the ball getting stuck in the roof with a televison cameraman having to retrieve it. 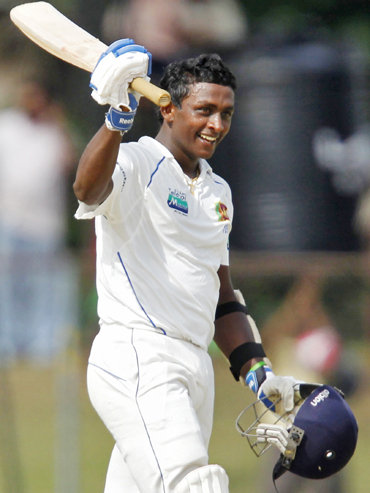 With the last batsman Chanaka Welegedara joining him, Mendis went for his shots in a bid to try and increase the lead. The Sri Lankan second innings came to an end when Mishra got rid of Mendis with Suresh Raina taking a smart catch. Mendis' 157-ball innings was inclusive of 10 hits to the fence and one over it. Resuming at 45 for two, the hosts lost their first wicket early in the day when Suraj Randiv, who was lucky to be dropped by wicket keeper Mahendra Singh Dhoni, was finally dismissed the next ball being trapped lbw by Pragyan Ojha. Overnight at an individual score of 12, skipper Kumar Sangakkara began by stabbing Ojha's outside-the-off-stump delivery for a boundary at the slip region. The former captain, however, perished as he nicked an Ojha delivery flighted around off and middle to the Dravid at slips. The Lankans suffered the third jolt of the day when Sangakkara trying to break the spin trap ended by driving a Ojha delivery straight into the hands of Suresh Raina, who grabbed the catch in his second attempt. 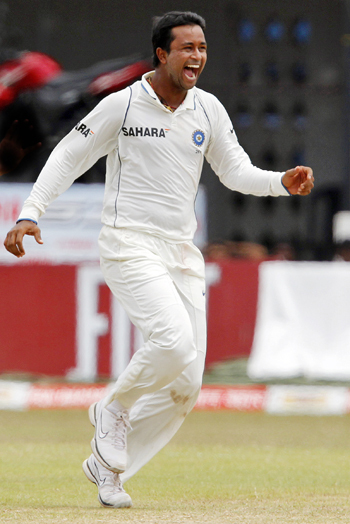 Ojha took three wickets in the innings to take his match-haul to seven.